Navigate: My Verizon > My Devices > Ringback Tones (in the My Products & Apps section) > Administra timbres para llamadas entrantes (debajo de Acciones adicionales). 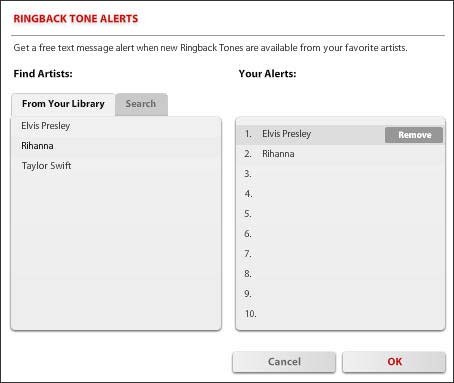 If presented with a caution notice, click OK.
Click Manage Tones dropdown arrow, then click on Manage My RingBack Tones. Click Ringback Tone Alerts (at the upper-right corner of the screen). From the From Your Library tab, drag and drop the desired artist(s) on the Your Alerts field then click OK.
To search for artists, click the Search tab, enter the desired name then hit Enter on the computer keyboard. Navigate: My Verizon > Manage My Device > Administra timbres para llamadas entrantes (debajo de Acciones adicionales). 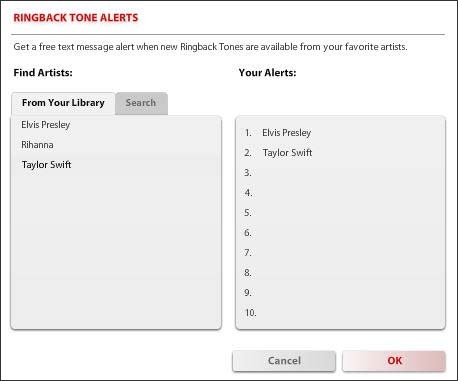 Click Ringback Tone Alerts (located at the upper-right corner of the screen). Highlight the desired alert by placing the cursor on it then click Remove. Repite este paso para eliminar más alertas.